Samsung Galaxy S4 pictures and specs leaked? | What Hi-Fi? Samsung Galaxy S4 pictures and specs leaked? The Samsung Galaxy S4 already has a launch date, and now the latest leak reveals some pictures, specs and key features of Samsung's new flagship phone. The latest leak around the Samsung Galaxy S4 phone purports to show pictures and some key specs ahead of the March 14th launch date. 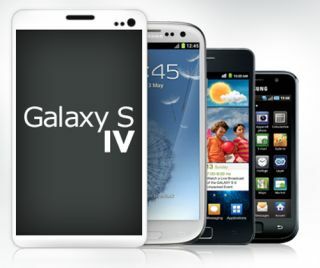 The information, posted on the Expansys website, shows the Galaxy S4 has a 5in Super Amoled full HD screen, with the 1920x1080 resolution equalling a 441 pixel per inch pixel density. The Samsung Galaxy S4 will also have 4G LTE network connectivity and a 13MP camera, if you believe this leak. Most, erm, eye-catching, are the new Eye Pause and Eye Scroll eye-tracking features. Building on the Smart Stay feature on the Samsung Galaxy S3, which kept the screen on as long as you were looking at it, the new features track your eyes when it comes to reading web pages and watching videos. Eye Pause will stop a video if it detects you've looked away, while Eye Scroll will mean the screen will scroll down as it detects your eyes read down the page. Pretty clever, huh? The leak also suggests the Samsung Galaxy S4 will use a new Exynos 5 OCTA processing chip, which essentially uses two quad core processors as opposed to the single quad core processors seen on most flagship phones. This aims to deliver the same speed required for gaming, HD streaming and other high-power functions, without using the same amount of energy. Will the S4 battery life set a new benchmark? Let's hope so. The specs on the website suggest a 2500 mAh battery. A 13MP camera with an LED flash, Android 4.2 Jelly Bean OS, a Corning Gorilla Glass 3 screen and a choice of 16/32/64 GB memory (plus SD card storage) is also on the supposed spec sheet. The pictures don't reveal a huge amount about how the phone will look - hey, it looks like a phone - though we couldn't help but notice it's more than a little reminiscent of the iPad Mini. The rumours will end when all is revealed at the Samsung Unpacked event on March 14th, which we will be covering live here on whathifi.com.